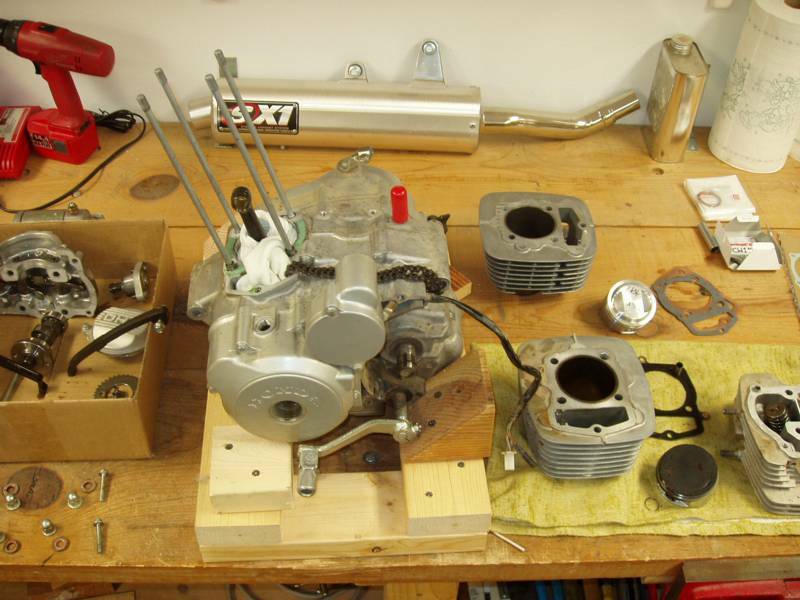 In November, 2003, I decided to do a big-bore kit on my own because no one had yet made one for the 230F. It turned out to be harder than I thought, and I eventually gave up. (Read about it here.) Then, in January, 2004, BBR and Engines Only announced their big-bore kits. 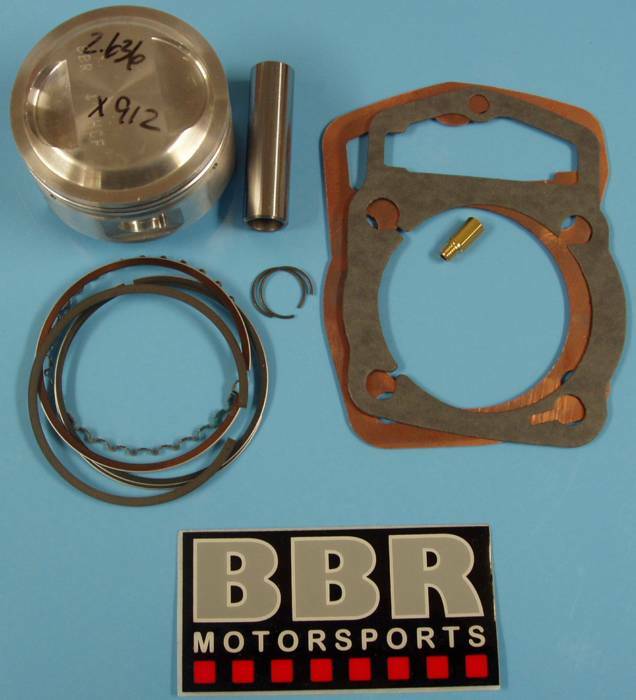 The BBR kit consists of a new piston, rings, pin, and gaskets. 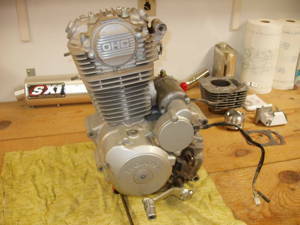 Bore the cylinder, install the new piston and other parts, and go riding. The kit increases displacement to 233cc, although BBR calls it their 240 kit. Price is about $170. 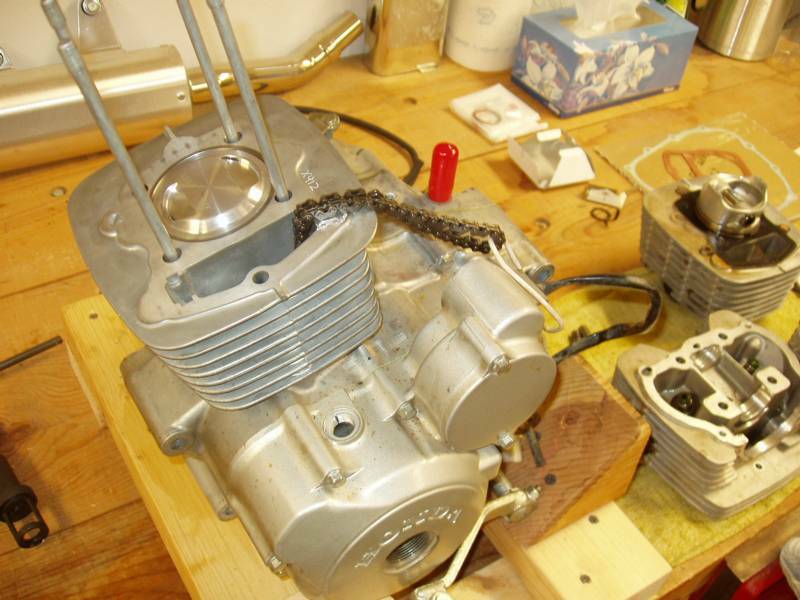 The Engines Only kit includes a re-sleeved cylinder (exchange), new high compression piston with rings and clips, all top end gaskets and jetting. This kit requires case machining. 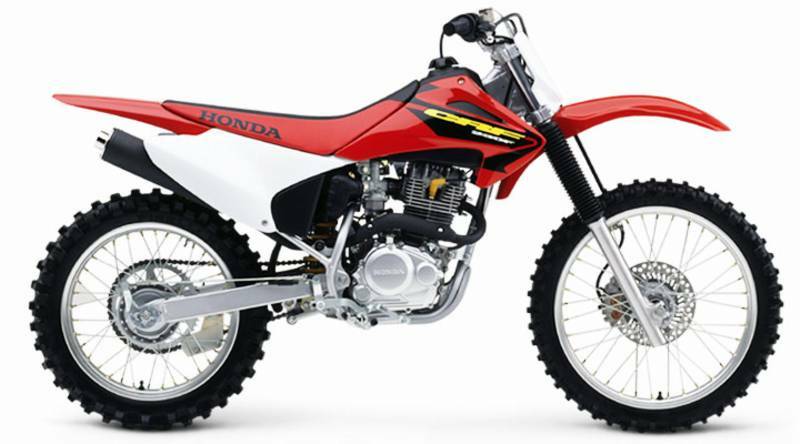 This option is beyond my means; I'm getting a CRF250X in March, and I have to draw the line somewhere. 1/22/04 - I called BBR and ordered the kit on the very day they announced it. They told me I was the first one to order the kit! 1/27/04 - I got the BBR big-bore kit today. The piston is made by Wiseco and is a jewel in its small size. The high dome is evidence of the higher compression ratio. 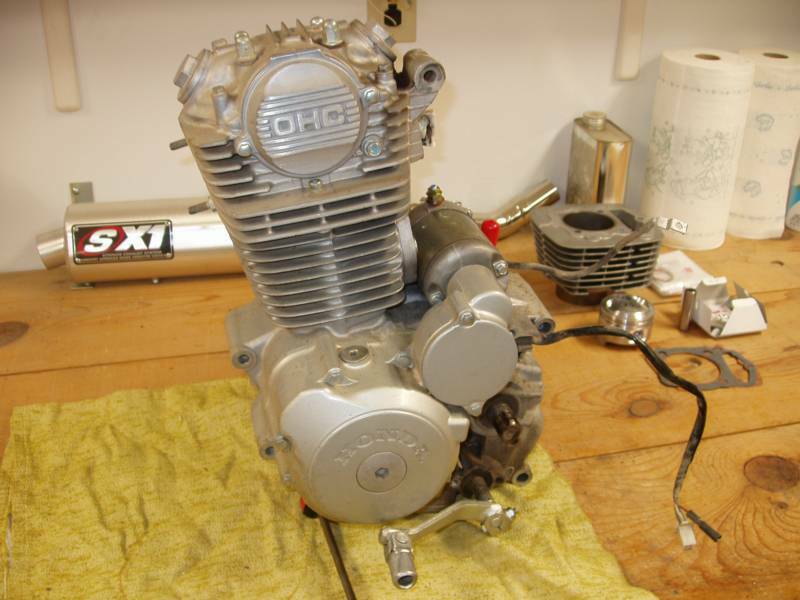 In the piston picture, the BBR piston is on the left, and the stock Honda piston is on the right. The numbers on the piston were written by the Millennium machinist. 2.636 is the piston diameter in inches; X912 is the work order number. 1/28/04 - I sent the new BBR piston to Millennium so they could bore the stock Honda cylinder that I had mailed to them in November. They needed the piston so the bore can be precisely matched. Gotta clean up the work area in the garage while I wait for the bored cylinder from Millennium. 2/6/04 - I got the bored cylinder back from Millenium (and the BBR piston I sent them). The work bench is clear and ready for engine work. Gotta wash the bike first. Stay tuned. 2/8/04 - Removed the engine. 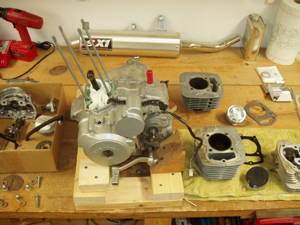 Removed the starter motor, head cover, head, cylinder, piston and other bits. The piston top (lower right in the picture on the right) had more carbon buildup than I liked, and there was evidence of blow-by on the top land on the exhaust side. The area below the top ring was clean. Tomorrow I'll clean all the gasket residue off and put the new parts in. 2/20/04 - Still waiting for parts for the head. 3/15/04 - After several very short thermal-cycling rides, I finally got the 230F out on some ATV trails for a 20 mile ride. It was pinging/detonating badly on hills. I'm guessing that the high-compression piston is the problem. After the ride, I worked on the problem. I went up one on the main. I read in the Owner's Manuals that Honda recommends 91 octane, and I've been using 85 and 87 octane. I drained all the old gas and filled the tank with new 91 octane gas. I plan to ride at Texas Cr tomorrow. 3/16/04 - I rode 25 miles at Texas Cr. The results were mixed. Most of the detonation is gone when riding on level ground and trails, but I've still got some detonation on very steep hills; I plan to raise the needle. The mid-range power seems very good, maybe 10% better than stock. (It's hard to quantify.) This is exactly what I wanted. 3/24/04 - After several test rides, with ever larger main jets and adjustments to the needle clip, the 230F is now running great. I eventually ended up going up 4 sizes on the main jet (to 108) and raising the needle to the max with the clip in the bottom position. I'm running a slightly modified intake and exhaust and NOT using the power-up kit. If you are using the power-up kit, you would probably only go up 2 or 3 sizes on the main and no changes to the clip. As I was going through these jetting changes, I began to wonder if the bike would ever run good, but I'm glad I stuck with it, because the 230F runs better than ever. I may drop the main one size when I start riding high-mountain trails. The big-bore kit provides no noticeable change to the low end or top end, but the mid-range is significantly stronger. I mentioned 10% before, but that's really a guesstimate. It's definitely stronger than stock. I'm happy I made the big-bore modification, and it's worth the $200 it cost me.